AUD is still the strongest currency and after its small attempt of strength it is edging down again this morning. USD is the 2nd strongest currency and after a bit of weakness it is strong again. NZD is the 3rd strongest currency and like the AUD it is weakening again today. 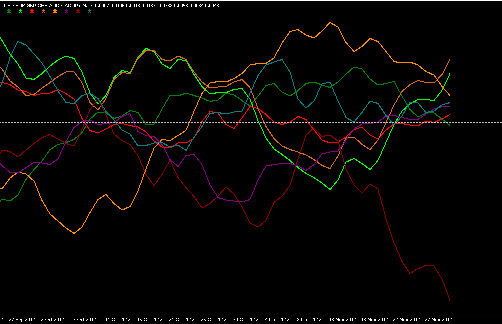 CAD is the 4th strongest currency still edging up nicely, the only currency with a steady trend. JPY is the weakest currency and after its attempt to strengthen it has fallen back into weakness. EUR is the 2nd weakest currency and rallying again. CHF is the 3rd weakest currency and it is also edging up into strength. GBP is the 4th weakest currency and it keeps bouncing on the line dividing strong and weak, one currency that seems to be very confused. Traders note: Due to the EUR and CHF being strong in weakness they are your riskier trades in todays session. Attend our Free Trading Workshop on the 1st of December from 9h00 - 12h00 at our office in Woodmead and stand a chance to win your FREE Forex Training Program worth R5000.00!!! Winner will be announced after the workshop!